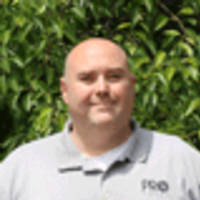 For approaching a decade, the fundamental Object Video tripwire patent has been at the core of an industry debate over patenting and video analytic usage. 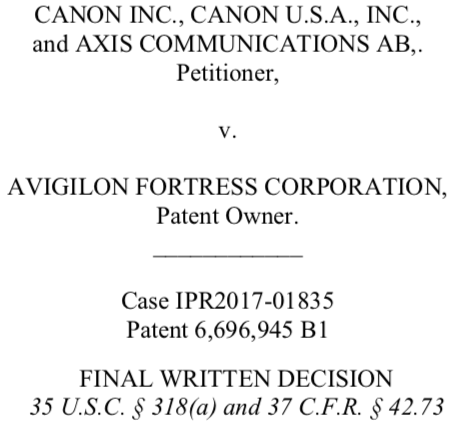 Now, that patent (acquired by Avigilon a few years ago) has been annulled as Axis / Canon's petition to invalidate the tripwire patent has been granted. Inside this note, we examine the overall legal battle between Avigilon and Axis, how this was annulled and what impact it has for the industry. *** *********** * ******, *** *********** ****** ***** ******** ****** has **** ** *** **** ** ** ******** ****** **** patenting *** ***** ******** *****. ***, **** ****** (******** ** Avigilon * *** ***** ***) *** **** ******** ** **** / *****'* ******** ** ********** *** ******** ****** *** **** granted. ****** **** ****, ** ******* *** ******* ***** ****** ******* Avigilon *** ****, *** **** *** ******** *** **** ****** it *** *** *** ********. *** ***** *** ********** ** **** * ******* ***** *********, an ***** ******* ********** ****** **** **** ***** ********* ********* tripwires *** ***********. **** **** ** ****,**** *********** ***** **** *****, *******, *** ****, ******************* *** ** *** **** ** *** **********. *** ****** being ** **** *** ****** ** ** *********** ** ****** any ***** ******** ****** ** ** ******* *********** (**** ********* and ******) ** **** ** ********* ***** *** ********* **** to *********** ******** ********* **** ****** ****** ** ** ****** scene. ***** **** ** * *********** ***** ** ******, **** ** part ** * ****** ***** ****** ******* ******** *** **** (and **** ****** *****). ** ****, ***** **** ******** *** ****** ************. ***, **** ** *** **** * *****,**** ***** ** ********** * ******** *******, ********* **** *** **** *** ****** ***** **** ********. At *** **** ****, ******** **** **** *** ********* ** NDA. *** ** **** *** **** * *** *********. *******,******** ******** ****** *****'* ******* ** **** *** $** *******, *********** ********** ***********'* ************* ****** ********* ******** ***** ********'* then *** *** ** * ***** ** ***** *******. ***** the ********* ** *** *******' ******** (** *** ** ******* tend ** ** ******* ******* *** *** ********** ********** ** a ******** ** **** *** **** ****), **** ********** *** often ****** **********. ********** **** *** ********** ** (** *****) ******** ****, ********* this ****** ********** * ***** ******* *** ********* ******** **** they *** *** ********* ********'* *******. **** *** **** ********* a ******* *** **** ** **** * *** ****** ****** area ** ******* / ****** ** * ***** **********. **** **** *** *** ********'* ****** *********, ******, ** *** means. ******** ***** *** **** ************ ** ***** ********* *******, ****** ******** *** ******** *** *** *** **** ********. ****, ** ******* ** *** **** *******. *** ******** ****** was **** *** ***** **, ** **** ***** ** *** next *** *****, *** ****** ***** **** ****** ******* (****** when ** ****** ** ******* ***** ******* ** ****** ***).  **** ** *** ****** **** ** * **** **** **** has *** * ****** ****-*** **** * **********. ** ******** 2018,******* ********* ************ ** ***** **** *****-****** ****** ***** *********** * ******* ****** ** ************ **** ******. **** **** *** ******** ******** ** ******* ** **** ** the ******. ....******** ******** ****** *****'* ******* ** **** *** $** *******...******** the ******** *** *** *** **** ********. *** ******** **** *** ******? ***** ********* *** ******** *** ******* ***** ********? * ***'* *** it. ******** ** ** ****** * ******** ****** ******* ** it *** ******** ** ******** ********* ***** ****** ** *** NYSE. *** ******** ********* ** * ***** ****** ******* **** * variety ** ********** **** **** ** *********** **********. *******, *** the ***** ************ ********* ******, ** ** ********. ******** **** *** ****** *** ****** ** *** *****. ******* stifle **********. **** ***** *** ********. * *** *** *** * ************. Does **** **** *** **** **** ******* ** ****? **** certainly ****. **** * **** ******* ********** ** *** ******** patent ****** ** **** ** *** **, *** ******* **** to ***** **, *** *** ***** ****** ** ******* **** some ** ***** ********* *****. *'* *** ****** ******** *** an ****** ** *** - * ****** ***'* ****. *********** was ********** * ****** ***** ** *** ***. ****: * *** *** **** *** ********. **** ********* **** ******* *** **** *********** ****** **** ***********. That *** *** ***** **** **, **** ** ****** **** weapon. *** ** * ***'* ******** ***** **** "******* ****** **********" but * ** ***** **'* **** ** *** **** ****** broad ******* ** ******* **** *** ******* ******* ******* ****** considering ******** ***** *** *** * *******. *******! ******* ****** ** * ****** ** ******* **, *** a ******. ******* *** *** ****** **** ********** *** ********* ** ********. Say *** **** ** **** *** **** ***-**** *****. ** there **** ** *******, **** *** ***** **** ******* *********** that **** *** *** **** ***-**** ***** **** **** ****** from ******* *** **** ***** ****** *** **********. ****'* ** oversimplified ****, *** **** ******* ** **** **************. * *** ****, ** * *** *******? **'* * ****** ***** ********** **** * ******* ***** ***** patent *********. ** ** *********, *. *.,** **** ******** ********* ******. * ** ******** ***** ** **** **** ** ***** ****** to ** ** *** **'* ************* * **** ** ********. ** **** ***, *** ** **** ****? ** *** ******* points ***, *** ****** ** *** ** ****** ****. *** much *** ***** ****** ** ********** **** *** ******, *** much ******* *** **** **** ** **** ** *** ** license ****? ***** **** ****** **** ********** *** ********* ****** again? ** * **** *******, * *** ***** ********* ***** after ****** *** ****** ** ****** ****, "* **** ** could **** **** ******* ** *** **** *****..."
***** **** ****** **** ********** *** ********* ****** *****? *** ***** ** **** ** **** **** **** * ****** patent. ******** *** *** ** ** ********* ***** **** **** is ******* ** ** ** ********'* ***** *******. ****, **** ** ****, **** **** **** **** * ******* dollars ** ******* ** **** **** *** ***** ***** ** may ** ***** ******** $***,*** ** ********** **** ****** ** save **** ** ****** *********. **** **** **** *** **** ***** **** ***** ****** ******* that *** ********* ******* ** ********* ** ********/********? **** ***** have *** ***** *** ***** **** ******** *****'*? ****** ********, because **** *** ****** ***** ************.